A slouchy oversize striped tee – so comfortable and perfect for blobby days. But totally acceptable in case somebody knocks on the door. Although with that look on my face they might get the hint and leave! I exaggerate – there is actually some shaping hiding in there, and some side splits too, but you get the picture. The fabric was a slithering slinky curling mess once cut, and what should have taken 15 minutes to sew took about 150! This is a v-e-r-y stretchy lightweight jersey that I picked up at a designer fabric sale recently (Moa in West Lynn). Nightmare to sew, lovely to wear – so possibly worth the effort! I bought twin needles – with my new domestic machine I can do things like that, which is very exciting for me! The widest needle caused a tunnel effect because this fabric is so lightweight, so I switched to a 4mm needle which helped. The neck band and hem were twin needled, but the cuffs did not need hemming because the hem was cut on the fold. Funnily enough this is probably a trick I learnt to do because I lived so long without a twin needle! 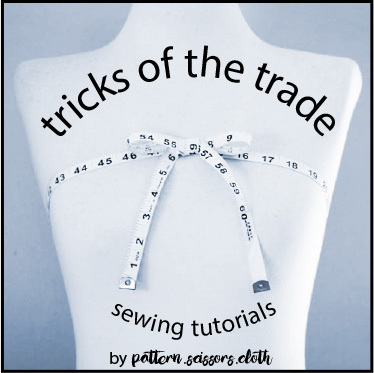 Do you make everyday basics, or prefer to sew more interesting things? I think I’m in the more interesting camp as I like continually learning and developing skills. But basics can have their challenges too, like handling this crazy fabric and learning to use a twin needle! And on the topic of twin needles – do you have any tips for preventing the tunnel effect? On my industrial machine I would loosen the bobbin tension, but I’m not sure how to do that on my little Pfaff which has a drop in bobbin. Handy hints most welcome! Ah, I’ve had that happen too. I thought it was just me! Thanks for that tip Siobhan, I might have to invest in some wash away stabiliser – this fabric was driving me crazy! Nice tee! Though possibly a bit hard to fit under a jacket. I love slouch tees like this – bu then I need to put something on top and change my mind. As for how to avoid seam tunnels, I’ve found wash-away stabilizer is a great help. I hear away most (sometimes I remember to moisten the seam), the rest leaves in the first wash. I second the use of wash-away stabilizer! I’ve bought it in a large sheet, meant for machine embroidery I think… then cut it into 1/2-3/4″ strips with a rotary cutter. It was pricey but with this technique a little goes a long way! Lay it on top of your fabric at the hem and let it slide underneath your presser foot as you’re sewing. When you run out of one strip, overlap another one & keep going. As NaughtyBun says, carefully tear away the excess and then the rest come out in the wash! Thanks – I think I’ll invest in some wash away stabiliser and do some experimentation! Luckily it is warm enough here at the moment to leave a jacket at home! I just checked out the Mandy Boat Tee and it is really similar, except mine is even more oversized! I really like this slouchy tee. As to the tunnelling, try having your two top threads unwind in opposite directions. This used to work for me sometimes! Thanks! That sounds like something else I need to look into! I love slouchy, sloppy wear…especially if it has an elastic waist band. 🙂 As for tunneling, buy a serger! It has so many uses beyond the hem and I use mine to finish fabric yardage before throwing it in the wash before sewing. I have the Brother 1034D, a very trusty and inexpensive machine. I’ve had it for over 10 years with zero problems and it’s still on the market. Christmas is coming and you deserve it! There is a lot to be said for comfort! I have a serger but it is pretty old so maybe I do deserve a new one! I haven’t used it for hemming though – maybe I should look into that. I do like the look of a twin needled or coverseamed hem. Perfect timing! As I was searching for something to wear yesterday, I thought I just needed something casual and WITHOUT paint spills!! Haha! Our house is high maintenance and there is always something that needs painting, and no matter how hard I try not to, I always get paint somewhere on my clothes! Nice top – definitely a good basic! For twin-needle I often use wooly nylon in the bobbin and try different tension settings if it is tunneling. For very stretchy fabric I’ve lately been using starch on it before sewing and that seems to help with manageability. I haven’t tried starch yet for twin needle hemming yet, but I think that may work. In the past I have either put a stabilizer (sulky wash away) or tissue paper (gift wrapping type) underneath the fabric and that works fine (though it is annoying to pick out the tissue paper). Or, the most reliable method is to use a fusible seam product on the edge, like steam-a-seam “lite”, press it into place, and then stitch. This makes the fabric more stable and a little denser and it usually turns out quite well. I second Jenl. That and sometimes I use an interfacing for knits called knit tape. This fabric was really too drapy for fusible tape to be used in the hem – if I could have I would have! I haven’t tried wooly nylon, so looks like that will be on the shopping list too, along with starch! I love making basics as I can’t bear to bring myself to buy them and I wear them 99% of my life! Uggh twin needling can be so fickle! If the hemline doesn’t need to stretch I don’t bother with a stretch stitch! I’ve found overlocking the raw edge to add some stability then fusing the stitching line down with Steam A Seam helps. Shelley wrote a great post on the Oliver and S blog a while ago on twin needling and from memory she bought a second bobbin case that she tweaked to specifically use only with twin needling as she sews a lot of knits for her kids. You are right that sometimes hems don’t always need to stretch much (this top doesn’t because it is so huge! ), and we can always be a bit careful when wearing them anyway. On my industrial machine I often double fold and plain sew a knit hem if it is for myself, if I loosen the tension a bit it is actually quite stretchy. Thank you for the Oliver and S tip – I read that and it looks like a second bobbin case might be on my shopping list too! Who said we sewed clothes to save money?! The best tip I have for using twin needles is using them with a walking foot. Careful, though, for some reason my walking foot sometimes loosens my needles and it falls out. But it makes the fabric perfectly smooth. That and playing with the upper tension. And slightly pulling the fabric before knotting the twin-needle-seam, so the thread can even out. I don’t have a walking foot for my machine but it is a Pfaff and it has the IDT system which has a similar effect! My problem is really that the lower tension is too tight, causing a tunnel effect to the twin needling. Thank you for that link! I had a read and it is just what I needed to know! Basics do make great palate cleansers and I tend to make them regularly because they are what I wear mostly. I do find it is nice to make thing more technically challenging as well. As for the tunneling, I can’t help there. I use a coverstitch machine. Lucky you having a coverstitcher! I have access to one at work, but the stitch settings are specialised and I don’t like the look. I’d get in trouble if I tried to change them! Twin needles can be tricky! I often think it boils down to how temperamental the fabric is, stretchier stuff seems far more tedious to hem. Stabilizers, such as spray starch, knit interfacing can help, or Wondertape has been pretty kind to me. I keep scraps and experiment first… often as entertaining as the sewing itself! This fabric was very temperamental! It is definitely to blame, as I got good results on better behaved fabrics! I’ve found having a different bobbin case with lower tension, a walking foot, and knit interfacing are helpful to stop tunnelling, but have now gone back to zig zag stitch as so many of my painstakingly sewn twin needle gems have snapped. They just don’t have the elasticity of the humble zig zag! Oh that is a shame, zig zag is still cute though! I’m going to keep trying, and will look into an extra bobbin case and some wash-away stabiliser! Love that tee. And I’m reading how others handle that type of fabric. I made a tee over the summer, and that kind of knit is NIGHTMARE-ish. Comfy, but yeah….